In the U.S., production of food products in the aerosol form is on the rise. According to CSPA’s 2016 Aerosol Pressurized Products Survey, the U.S. production of aerosol food products has increased every year since 2007. Over the last 10 years, the aerosol food products category has grown 28.5%, with production reaching an estimated 576 million aerosol containers. Consequently, it’s important for the aerosol industry to be aware of the ongoing changes with the U.S. Food & Drug Administration (FDA) and the Nutrition Facts label. Figure 1: A side by side comparison of the current and new Nutrition Facts labels. In May 2016, the FDA announced and published changes to the Nutrition Facts label requirements for packaged foods, marking the first changes in over 20 years to the label. The intent of the new nutrition labeling requirements is to make it easier for consumers to make informed decisions about the food they purchase and eat. For aerosols, this would cover products such as pan sprays, whipped cream, spray cheeses, iced coffee in aerosol containers, spray food colorants and batters in aerosol cans, among many others. 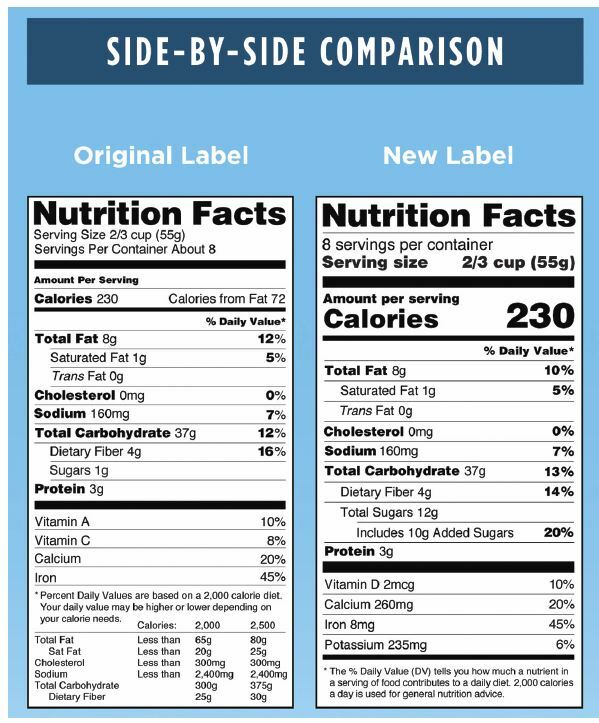 Manufacturers will need to update their labels by including nutritional information not previously required on the label, modifying the daily value percentage of nutrients based on changes to recommended dietary needs) and changing some aspects of the overall format to better inform consumers. When these changes were originally published, the mandatory compliance date was set for July 26, 2018 with small manufacturers (annual sales less than $10 million) having an additional year extension with a compliance date of July 26, 2019. However, on June 13, 2017, the FDA announced it will extend the compliance date following industry and consumer group feedback. The extension allows manufacturers additional time to complete and print new labels for their products. As we go to press, the FDA has not announced the new compliance deadline. Added sugars will be displayed in grams and as % Daily Value on the label. “Vitamin D” and “Potassium” will be required on the label, replacing “Vitamin A” and “Vitamin C.” These vitamins, along with other vitamins and minerals, can still be listed, but are not required. The “Calories from Fat” listing is being removed, but “Total Fat,” “Saturated Fat” and “Trans Fat” will still be required to appear on the label. The new label will have increased font sizes for “Calories,” “servings per container” and “Serving size” declarations. The number for “Calories” and the “Serving size” declarations will be bolded. The daily values for various nutrients have been updated based on newer scientific evidence from the Institute of Medicine and other reports such as the 2015 Dietary Guidelines Advisory Committee Report. The label will have updated serving sizes based on the amount of food people are actually eating. Package sizes influence how much people eat. For packages that are between one and two servings, the calories and other nutrients will be required to be labeled as one serving. Certain products that are larger than a single serving size but could be consumed in one sitting or multiple sittings will require a “dual column” label, which will show the number of calories and nutrients on both a per serving and per package basis. While awaiting a new compliance date from FDA, companies should continue the transition to the new label or begin preparing to change the labels if you haven’t started. Some of the daily values for nutrients have changed drastically based on new dietary recommendations, so it will be important to know the nutritional value of each nutrient within the product to accurately recalculate the % Daily Value. U.S. Food & Drug Administration, Changes to the Nutrition Facts Label. (2017, June 19).